Google Analytics is one of the most essential tools for data-driven businesses. 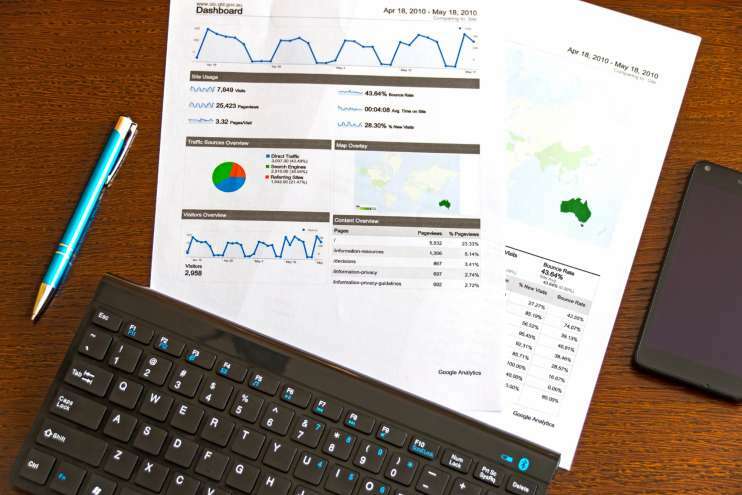 From tracking the demographics of website visitors to tracking what media sources are driving revenue, Google Analytics helps companies measure a wide range of meaningful metrics. The tool is able to do this thanks to its numerous built-in features. Even the most obviously Google Analytics functions can be useful, but some of the lesser-used features can help you get even more relevant, timely, and useful information. We’re going to look at 5 of Google Analytics’ lesser-used tools that will add immense value to your data and help you get the most out of your reports. Data visualization can be amazing. Not only are graphs and charts colorful, but they're also super easy to understand. This is something that Google understands very well. 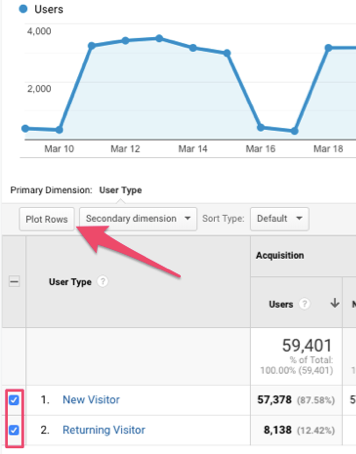 Easily accessible but hard to notice, Google Analytics offers the Plot Rows feature, which allows the user to plot up to four rows and compare data diagrammatically graphically. Let’s say you want to compare the rates of Returning Customers with New Customers. Instead of reading the rows with their numerical entries, you can use the Plot Rows feature to represent the data in an easy-to-understand graph. Comparing metrics visually like this can make your Google Analytics reports quickly actionable by visually expressing differences in dimensions. Now you can take one look at the image on the screen and learn about the performance of your website, instead of pouring over the numerous data entries in the report. Using plot rows: Just check the checkboxes located on the left-hand side of each row in GA’s default table reports, and this will select the rows you wish to compare. Click on the "Plot Rows" button at the top of the table, and you're good to go. Just remember to consider the scale of the analysis while you plot the rows. This feature doesn’t yet allow users to manage the scale of the plotting on the screen. Let’s say you wish to get real-time insights about your website, but you have thousands of data points to look at. Often, when you use Google Analytics to study your website performance, you tend to focus on the first 10 rows within a table. At most, you may study the top 20 rows. But with a massive dataset with thousands of rows, you may be missing out on valuable insights. If you want to get an accurate analysis of your website’s performance, you need to study all the rows of data on your report. This is where the Weighted Sort comes in. Google Analytics’ default sort lists metrics simply numerically. The Weighted Sort feature studies all the rows of data on your report and will sort percentage-based metrics by statistical significance (metrics like bounce rate, conversion rate, percent new users, etc.). Google Analytics uses a measure called "Estimated True Value” (ETV), to calculate the most accurate insights from your data points. The ETV gives you an estimated calculation of the data metric you are studying (for example, bounce rate, attrition rate, conversion rate, etc.) for each row. This can be a more meaningful feature than the traditional ascending & descending arrangement feature – where you only get to see the top or bottom performing rows. Using Weighted Sort: You will find a checkbox at the top of your report, entitled “Weighted Sort." Just check this box, and Google analytics automatically calculates the weighted results. “Channel” reports group sources and mediums into larger categories, e.g. traffic from organic Google searches will be included in the “Organic Search” channel and listed as “google / cpc” in the Source/Medium report. 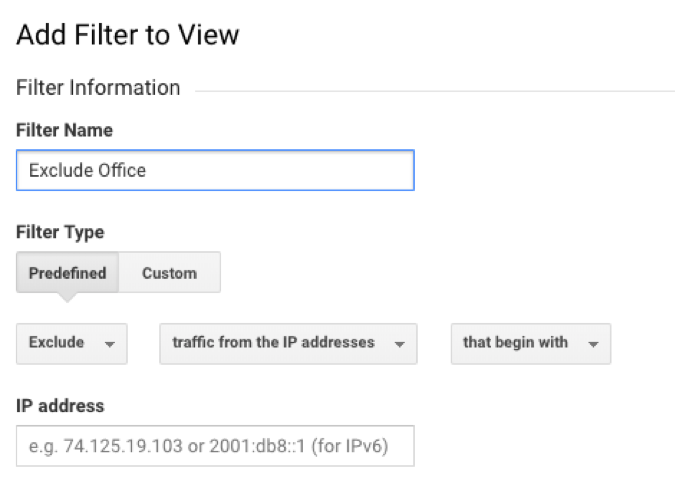 Google’s default settings for how it groups referring traffic into Channels may not accurately reflect how you are organizing your traffic-driving efforts. You may wish to categorize your visitors based on other criteria. 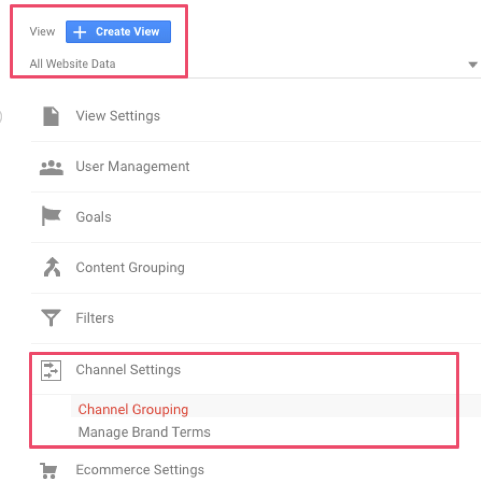 The Custom Channel feature in Google analytics allows users to segment and classify visitors into custom-built groups/channels. Let’s say you are running digital media campaigns but have different KPIs for outreach and retargeting efforts. You can create a Custom Channel that groups your traffic accordingly (presuming you’re using tracking querystrings) and quickly provides data for each group without requiring advanced segmentation. Without that customization, all visitors from your campaigns were categorized into a single default “display” channel. Using Custom Channels: From your Admin panel, select “Channel Settings” at the View level. Changes to the default channel grouping will permanently change how new traffic is classified and is not retroactive. Alternatively, you can select “Custom Channel Grouping” from the same menu. Select “Create New Channel” and define how you want your data grouped. This will provide you with a different way of looking at the data but not permanently change how data is categorized. Have you ever read through old reports and wondered why there was a sudden drop in visitors or a sudden spike in social media shares on a particular day, when the days before and after it, had the usual activity? Information is slippery, and you may find yourself having forgotten details about what was going on with your digital marketing on a specific day, which may prove to be very important for your website analysis in the future. This is where Google Analytics’ Annotations feature helps. Annotations are short notes that you add next to a date in your reports, just as a future FYI. These notes are available all the time, and you can use them to record important information which isn't part of the report, but which can add huge value to your report analysis. Essentially, annotations provide context. They help you understand the reason behind an occurrence, which can help you decide what changes you need to incorporate in your website and digital marketing, to either encourage or discourage the same from happening again. When used with plot rows, they can add layers of meaning to your data. Using annotations: Click on the tab located right below your timeline. Select “+ Create new annotation”. Select the date to which this annotation pertains and enter your notes in the next box. By default your annotations will only be seen by the user who created it, but you can select the “Shared” option, which makes the annotation visible to and editable by other users of your Google Analytics account. Google Analytics delivers lots of data, but there are many cases where you only want to analyze a subset of this data. In these instances, Google Analytics offers custom, or Filtered Views. For instance, you might want to filter out traffic to your website that comes from your own office so that your employees’ interactions with the site aren’t counted in your metrics. Another common use case for Filtered Views is excluding bot traffic or to create separate views for different business regions. This feature allows you to set-up limits which exclude certain criteria when you’re accessing that View. This ensures that no unrelated or unwanted data sneaks into your report. Using Filtered Views: You can set up filters from the Admin section of GA. As a best practice, create new filters at the account level and then apply them to the view level. Now create your new filter either using the Predefined Filter or the Custom Filter option. Next, select the view you wish to add for your new filter in the Available Views list and save. If you wish to make these changes directly at the view level, go through the View tab in your Admin Account menu directly and follow the same steps. Additionally, be very careful of filters that follow “Include or Exclude" statements and those that are "Queries," as they can be very tricky to manage. They may not give you the most accurate results. What else is missing from your Google Analytics set up? At Prove we’re dedicated to data hygiene and getting the right set up for every client. Contact us today for a free analytics audit by one of our Google Analytics specialists that will quickly identify what you could be missing. Claim your Google Analytics audit today!